Go means light used sometimes as Light of consciousness or Soul which is subdivided as powers within the human body to realize Moksha. 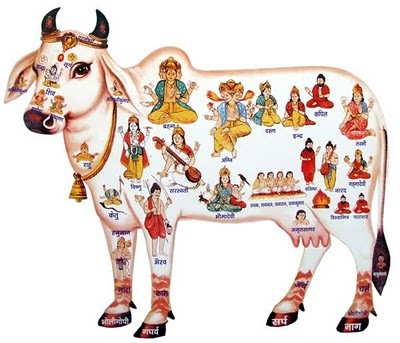 Some morons translated Go as Cow.Go-Vardhan Means Light of Lord Shiva.Go-vinda — Lord of Light not Lord of the cows,Go-pati — Sun,The word God also comes from Sanskrit. Go-Aatma or Light of the Soul or Gotama or Gautama,GODA STUTI or Praise of Goda or Praise of Light or GOD. Gopi mean disciples of Lord Krishna.The one who follows light not darkness.Go-ala means that which arrives with light or Gauala or Gwala not cow herder. Go also means cow in Sanskrit and when it is mentioned it’s either for milk or beef in the Vedas. Swamiji: What is the object of your society? Preacher: We protect the mother-cows of our country from the hands of the butcher. Cow-infirmaries have been founded in some places where the diseased, decrepit mother-cows or those bought from the butchers are provided for. Swamiji: That is very good indeed. What is the source of your income? Preacher: The work of the society is carried on only by gifts kindly made by great men like you. Swamiji: What amount of money have you now laid by? Preacher: The Marwari traders’ community are the special supporters of this work. They have given a big amount for this good cause. Swamiji: A terrible famine has now broken out in Central India. The Indian Government has published a death-roll of nine lakhs of starved people. Has your society done anything to render help in this time of famine? Preacher: We do not help during famine or other distresses. This society has been established only for the protection of mother-cows. Swamiji: During a famine when lakhs of people, your own brothers and sisters, have fallen into the jaws of death, you have not thought it your duty, though having the means, to help them in that terrible calamity with food! Preacher: No. This famine broke out as a result of men’s Karma, their sins. It is a case of “like Karma, like fruit”. The up-country preacher did not speak further on the subject; perhaps he could not understand the point of Swamiji’s poignant ridicule. He told Swamiji that he was begging something of him for the objects of the society. Swamiji: I am a Sannyasin, a fakir. Where shall I find money enough to help you? But if ever I get money in my possession, I shall first spend that in the service of man. Man is first to be saved; he must be given food, education, and spirituality. If any money is left after doing all these, then only something would be given to your society. At these words, the preacher went away after saluting Swamiji. Then Swamiji began to speak to us: “What words, these, forsooth! Says he that men are dying by reason of their Karma, so what avails doing any kindness to them! This is decisive proof that the country has gone to rack and ruin! Do you see how much abused the Karma theory of your Hinduism has been? Those who are men and yet have no feeling in the heart for man, well, are such to be counted as men at all?” While speaking these words, Swamiji’s whole body seemed to shiver in anguish and grief. There was a time in this very India when, without eating beef, no Brahmin could remain a Brahmin; you read in the Vedas how, when a Sannyasin, a king, or a great man came into a house, the best bullock was killed; how in time it was found that as we were an agricultural race, killing the best bulls meant annihilation of the race. Therefore the practice was stopped, and a voice was raised against the killing of cows. Sometimes we find existing then what we now consider the most horrible customs. In course of time other laws had to be made. These in turn will have to go, and other Smritis will come. This is one fact we have to learn that the Vedas being eternal will be one and the same throughout all ages, but the Smritis will have an end. As time rolls on, more and more of the Smritis will go, sages will come, and they will change and direct society into better channels, into duties and into paths which accord with the necessity of the age, and without which it is impossible that society can live. Thus we have to guide our course, avoiding these two dangers; and I hope that every one of us here will have breadth enough, and at the same time faith enough, to understand what that means, which I suppose is the inclusion of everything, and not the exclusion. I want the intensity of the fanatic plus the extensity of the materialist. Deep as the ocean, broad as the infinite skies, that is the sort of heart we want. Let us be as progressive as any nation that ever existed, and at the same time as faithful and conservative towards our traditions as Hindus alone know how to be. 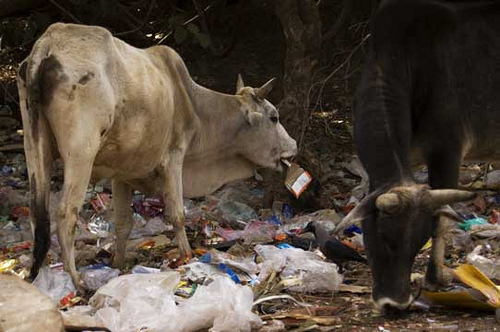 Cow’s eating cardboard and polythene.This is the condition of cows in India.People concerned can adopt them as pet. 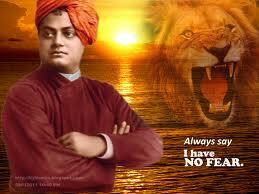 Swami Vivekananda expressed his opinion about cow protection; It need not be taken as ideal and follow. The cow protection need not be linked to human protection. They both indeed require in society. It depends on path we use. Some people can fulfill both ways and some can not. We do not use a medicine to kill cancer in place of medicine to kill aids. Both have different functions and different results. Dharma will change according to time and place. In this Kaliyuga, Only Sri Bhagavathgeetha gifted by Lord Srikrishna is utmost ideal and guide for everyone. Sri Geethacharya did not advice to eat meat or beef anywhere. He clearly mention that those who want Sathvika mind set, they need to eat only saathvika aahaara. We all aware that ” A man is what he eats….” here, It indirectly spreads a message that those who eat saathvika aahaara is a good human being and he will become ideal for everyone and he never hurts and harm human community or animal community. This will serve the purpose of saving human kind. It is like taking internal medicine against a decease by yoga and controlling mind to kill inhuman qualities in a human being “. We can directly help mankind who are in need as said above. It is a corrective action and definitely required. But we have to observe here that not eating meat and not killing cows and spreading sanathana dharma & spiritual knowledge are preventive actions. For example, to a highly corroded iron or steel member, if we paint, it is a corrective action. If we periodically paint before it gets worst is a preventive action. In fact preventive action will avoid sudden failures and so the corrective actions too. The great Indian sage Sri Sri Sri Mahaswamy Kanchi Paramaacharya raised his voice on Cow protection. He is walking God and still alive in the hearts of everyone. He is a Jagathguru and we can take his words ideal certainly. If your content is really true above what Swami Ji said on cow protection, It is a highest disappointing thing for me about swami ji as I personally respects him very much. So you mean Geeta supersedes Veda. Strange Pariwar comes with a gem every now and then. Tilak said that Aryans came from North Pole…. Golwarkar superseded that and said: ‘ North Pole was at one time in Odissa – Bihar border.’ Does that hold good , or is there any superseding gems available now? According to a 2006 report by the United Nations Food and Agriculture Organization (FAO), production of meat contributed between 14 and 22 percent of the 36 billion tons of “Carbon dioxide equivalent” greenhouse gases the world produces every year. Besides, the growing demand for beef had resulted in desertification of forests of Amazonian Brazil and other South American countries as they went on a spree to convert into forest lands into grazing grounds in the 1970s.